The green vase collector has found a new green vase at a very good bargain price ! This time a vase from Design Letters found in Decorate at a HUGE discount, 70% ! So instead of paying 1000 DKK (132 €) I paid 300 DKK (40 €), so now I can also afford to buy some flower for this new vase. The annual White market (Pinsemarked 2018) at Trapholt started today and will also be there tomorrow White Monday. The annual Christmas Fair at Trapholt has become a must-do-thing for me. However, I am less frequent at the Whit Markets, as I more often is rowing during the Whit. 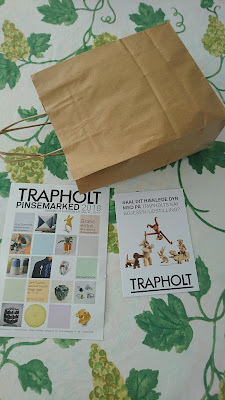 This year I took the time to for the market, as you can always find some great craft designers of very high quality at the Trapholt markets. So what could I "not live without" this time ? 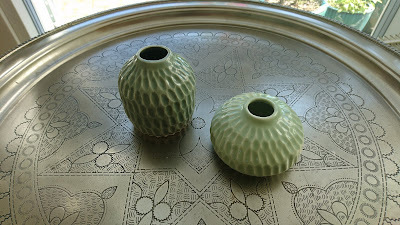 The small green ceramic vases made by Louise Maagaard, which I previously have been buying ceramic by. Can you get too many green vases ? Yes, will some people say, while other (perhaps only me) will say no ! And if you want to have a collection, when you need a certain amount of green vases in order to call yourselves a collector. I love green vases in ceramic, and they can cost anything from 5 € to 150 € per vase. The latest addition to my "collection" is this small green vase in ceramic from Simple Mess will small holes, which can keep the flower in place. This vase was one of cheaper one to 13 € on sale. 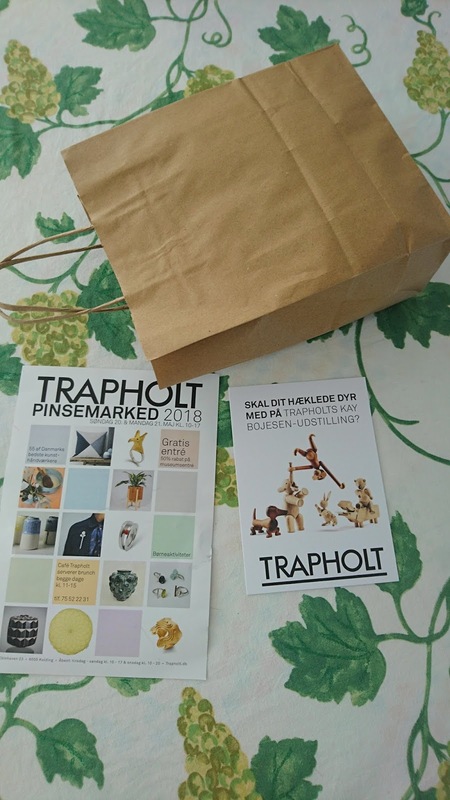 In Vejle 17 May 2018 was celebrated as Day of the Cake, where you could buy a ticket for 75 kr (10 €), which would give you entrance to a tent next to the town hall of Vejle. Inside this tent 4 local bakers had made a long table full of great looking and tasting cakes. You when had 45 minutes to eat as much cake as possible. The event was used to raise money for local charities, so you could fill your stomach with a good conscience. I did not taste all the cakes, your eyes can eat more, than your stomach can contain. My strategy is always to start enjoying the cakes made by Vanilla, which this one of the best cake shop of Vejle in my opinion. However, I managed to enjoy 11 cakes, and when I did not have any evening meal ! The Day of Cake has been taking place in Vejle since 2015, and I have always enjoyed taking part in this event (2017 Day of the Cake & 2015 Cake of the Day). And I am already looking forward to the next Day of the Cake in 2019 :-) Or as Arnold Schwarzenegger says in Terminator "I will be back".